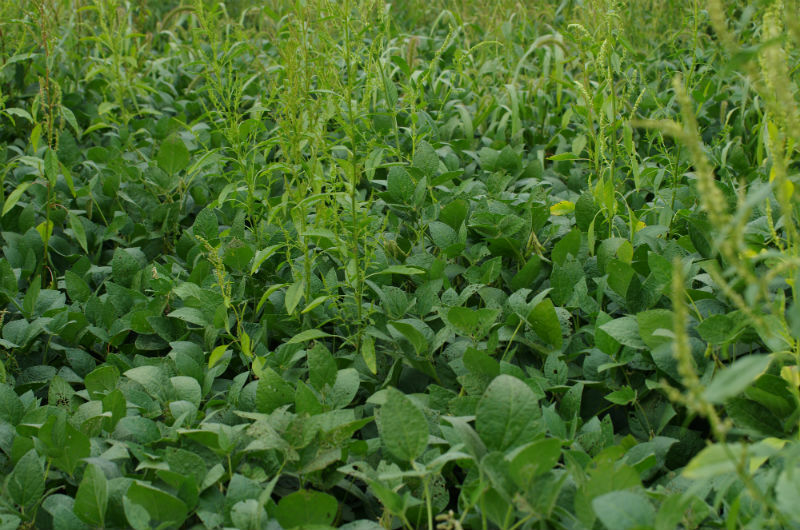 Are You Happy with Your Weed Control in Soybeans this Fall? Figure 1. 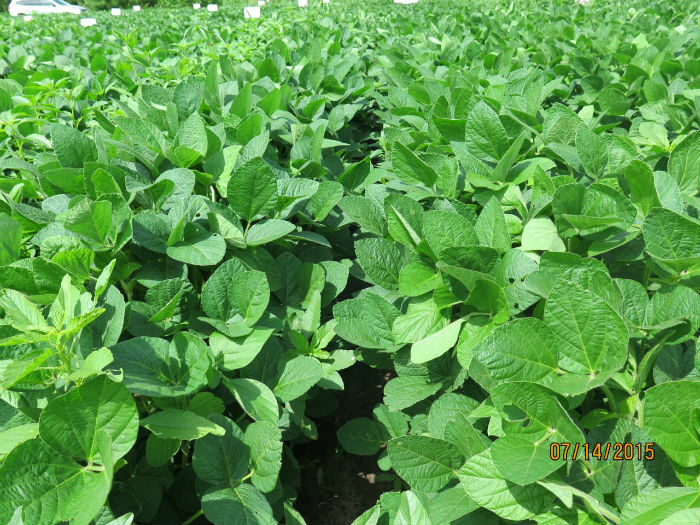 Weed escapes in soybean treated with a single preemergence herbicide application of Outlook and Pursuit on May 5. Photo taken August 6. With waterhemp becoming more widespread throughout the state and glyphosate resistance increasing, how do your soybeans look this fall? If they look like Figure 1, it may be time to change your weed control strategy. One strategy for dealing with glyphosate resistant waterhemp is to layer soil residual herbicides. This approach is being evaluated in Rochester, Minnesota and includes a number of residual herbicides in single and two-pass applications. 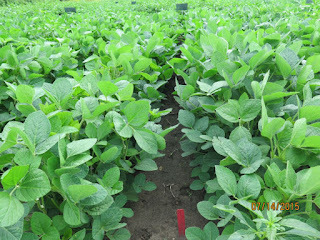 The herbicides in the trial include 1) Dual (s-metolachlor), 2) Outlook (dimethenamid-P), and 3) Warrant (acetochlor). They were selected because of their known effectiveness for controlling waterhemp and their flexibility in application timing. Pursuit (imazethapyr) does not control ​this population of ​waterhemp​ (ALS resistant)​​;​ however, ​it was applied in tank mixes with the pre-emergence herbicides to eliminate other broadleaf weeds. Figure 2. Comparison of weed control in soybean with a single preemergence application of Outlook (top) and layered applications of Outlook May 5 and June 8 (bottom). Photos taken July 14. Why does the need for multiple residual herbicide applications seem to be increasing? 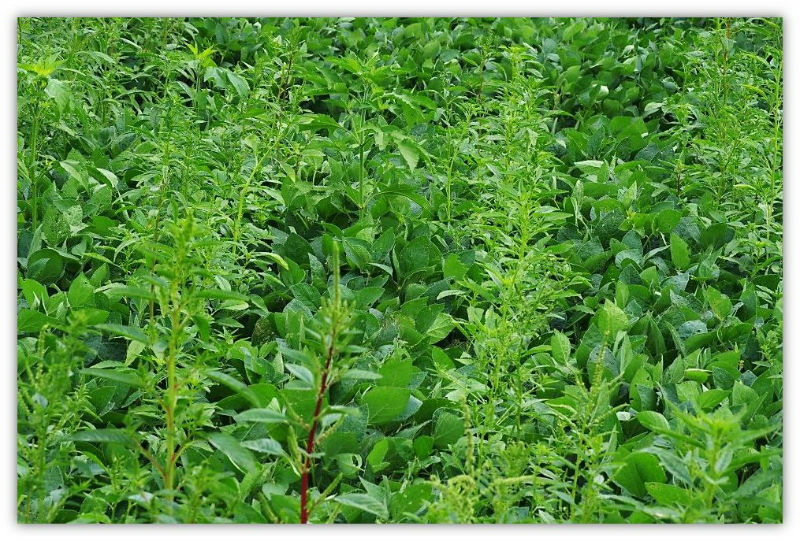 Waterhemp seedlings emerge over an extended period of time, frequently outlasting a single residual herbicide application, as shown in the top photo of Figure 2. When glyphosate is no longer effective, other strategies are needed. Several residual herbicides, including the ones in this trial, may be applied postemergence to the crop alone or in combination with additional post emergent herbicides (for example, SOA-9 (glyphosate), 10 (Liberty) or 14 (Cobra)). 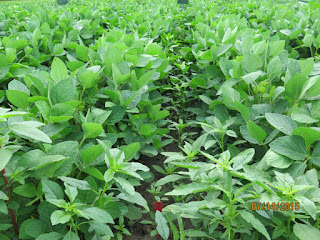 When activated by rainfall, these post-applied residual herbicides can extend the duration of waterhemp seedling control (Figure 2). Layered or sequential applications of Dual, Outlook, or Warrant herbicides provided significantly better, season-long control of waterhemp compared to their preemergence-only treatments (Table 1). Valor (flumioxazin) herbicide provided very good waterhemp control early in the season and significantly better than the Dual, Outlook, and Warrant preemergence-only treatments (Table 1). However, late season observations indicate that waterhemp control with Valor does not last as long as the layered Dual, Outlook and Warrant treatments (Figure 3a and b). These observations will be validated with a late season weed rating at leaf drop. Figure 3a. Late season weed control in soybean with a single preemergence application of Valor. Photo taken July 14. Figure 3b. 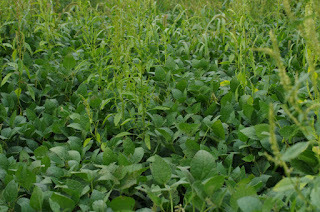 Weed control with Valor taken six weeks later on August 27. Stay tuned to Crop News for yield results and final weed ratings later this fall. A full research report will also be available at that time. 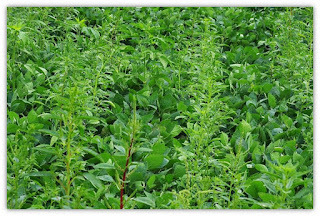 For more information on these preliminary results, see Managing waterhemp in soybeans with layered residual herbicides - A strategy for controlling glyphosate resistant waterhemp in Minnesota (preliminary report). Table 1. 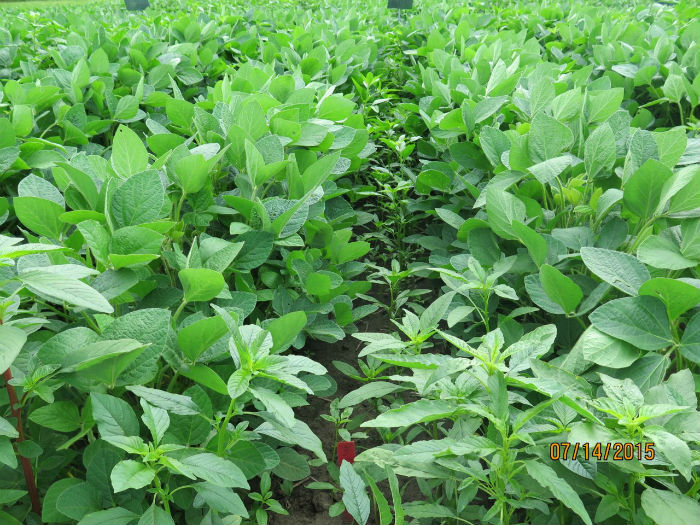 Common waterhemp control in soybean with single and two-pass applications of soil residual herbicides in Rochester, MN, 2015. Values followed by the same letter in the same column are not significantly different at the p=0.10 level. All photos are property of University of Minnesota Southeast Integrated Pest Management.